Summary: Some of the views provided by this walk are stunning, particularly the one looking north into Dovedale from High Hartsop Dodd. It is so good Wainwright made point of it in his pictorial guide to the Eastern Fells. 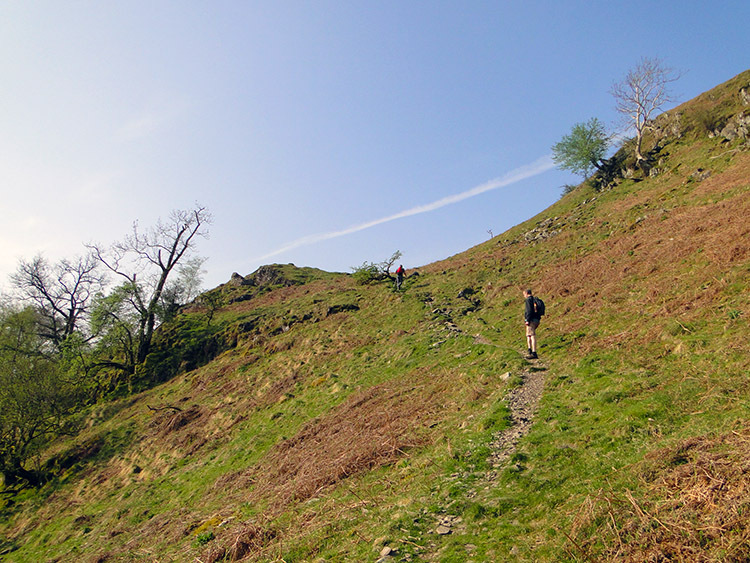 Starting with a steep ascent the walk is tough from the start but once on Hartsop above How the gradient eases with nice undulations, a climb to Hart Crag, more easy walking and then a final sting; it is a steep descent off High Hartsop Dodd requiring concentration. The Walk: I hit the wall on this walk, the point where utter exhaustion hit me in a moment. It was not a nice feeling and though I had hit the wall before it had never been as bad as this time. Once I had crashed it was difficult to recover myself from the wreck I was and only by struggling on for some excruciating time with legs of heavy lead did I break through the pain barrier. I guess some of you will identify with what I am talking about but if you don't then I hope you never have to. It was a bad time for me but my determination was set, it would not stop me enjoying a wonderful walk. It all started out so well. Jez had been in touch earlier in the week. His son Tom was over for the early part of Easter and they asked me if I was up for a walk. Of course I was and with Dave also available the four of us set out from Harrogate at 7.00am in order to reach Brothers Water by 9.30am and do my planned walk of the Hartsop Fells. The journey west went remarkably well for the last working day before Easter, apart from being stuck behind a huge truck transporting a very large earth moving vehicle on the A65 from Gargrave to Settle. The delay caused by the juggernaut was not enough to put us behind time and by 9.15am we were safely parked up in the car park at the northern end of Brothers Water. We were in good spirits and raring to go. 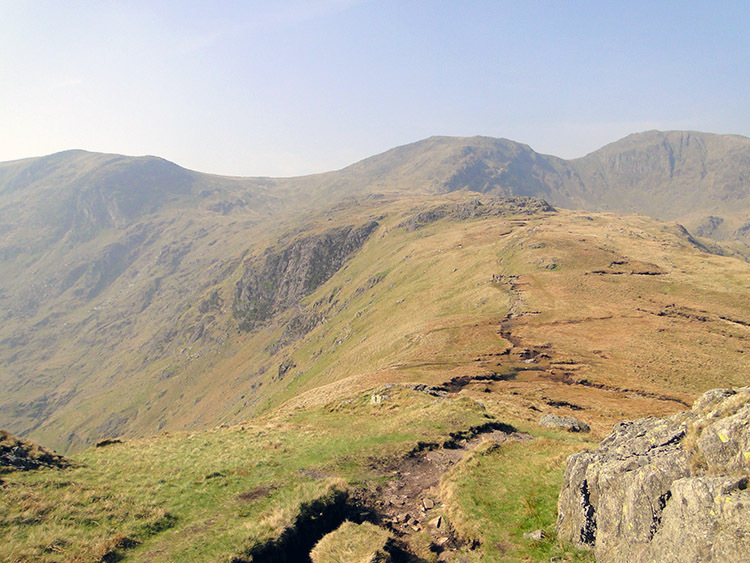 The walk I had planned was to complete seven Wainwright Fells by including the Hartsop Fells and the west ridge of the Fairfield Horseshoe which included High Pike and Low Pike. 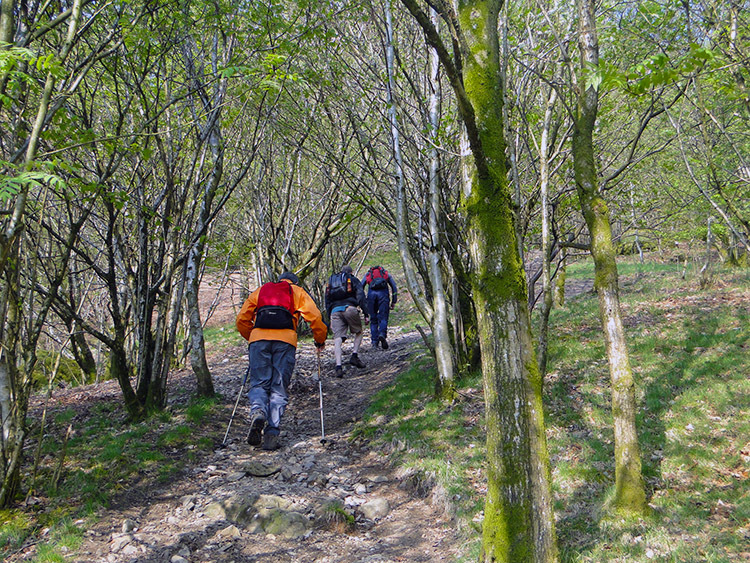 This route was still the intention as we set off by heading off due west and steeply climbing through the tree canopy of Low Wood. We all made good progress through the wood and emerged above the tree line in double quick time. 200 metres of ascent was completed, it was a lovely warm day and verging on the hot which was remarkable for April, albeit an April (2011) that was breaking all the recent records for good weather. It was great to be out, Brothers Water shimmered directly below us, hazy outlines of mountains appeared to the east and south and amidst the beauty we made a short stop at a rocky knoll to cast a layer of clothing. Shed of unnecessary layers we set off again on our continuing ascent toward the first Wainwright fell of the walk, Hartsop above How. Then it hit me. In a breath I stopped and watched my three companions move further ahead of me. I could not move without it being a huge effort. My legs, supple and fit minutes earlier were suddenly leaden. I was motionless, short of breath and I felt sick. I simply had to sit for a while and get my breath back which took a good couple of minutes. Then rested sufficiently I resumed the walk to find my friends, walking slowly but steadily. For about 100 yards I was OK, on a slight ridged incline toward Bleaberry Knott where the lads waited. Then almost there I had to stop again, leaden legs once more and more nausea. Another enforced rest followed and then I struggled on to reach my companions. We took another break and I took in needed food and drink. After the break they encouraged me on and kept ahead of me but not too far, all aware of my plight. Hartsop above How is a knoll on a long ridge three mile in length from Patterdale to Hart Crag. The ascent, normally routine was indescribably difficult, more heavy legs and more nausea but eventually I got there and on reaching my first Wainwright of the day I felt encouraged. Resting at the cairn I took in the beauty all around us. 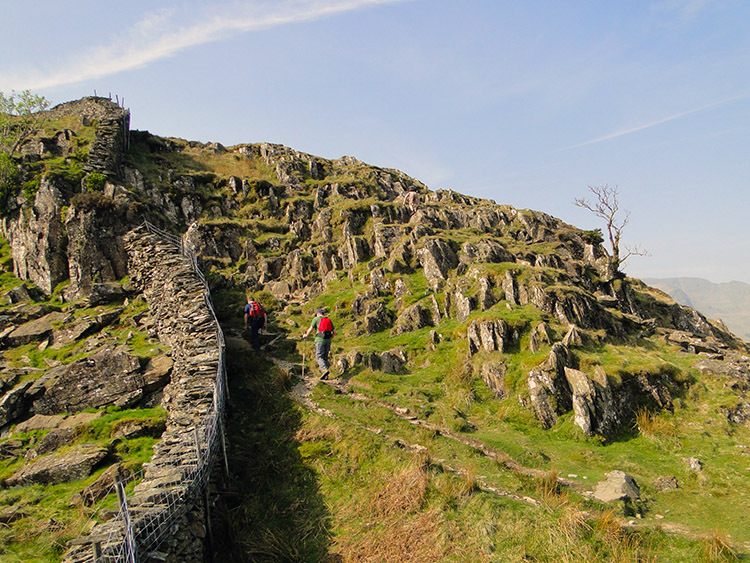 The magnificent south-east face of St Sunday Crag headlined with the Deepdale chasm between. 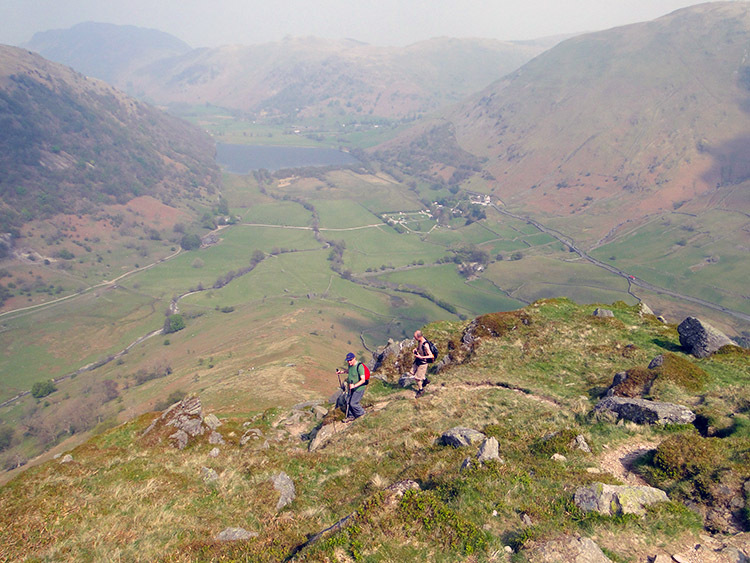 The views inspired and I made off from Hartsop above How to Hart Crag in good heart. I felt a little better after my first Wainwright was in the bag and although still weak I made decent headway toward Hart Crag, not too far behind the team and perhaps slightly gaining ground but it was a false dawn for when I started the steeper ascent over the final 300 metres on a 33% gradient over scattered rocks and scree I was back into deep fatigue. I took the 'climbing the staircase' attitude, 15 steps up over rock then a break, 15 steps more then another break, and so on. 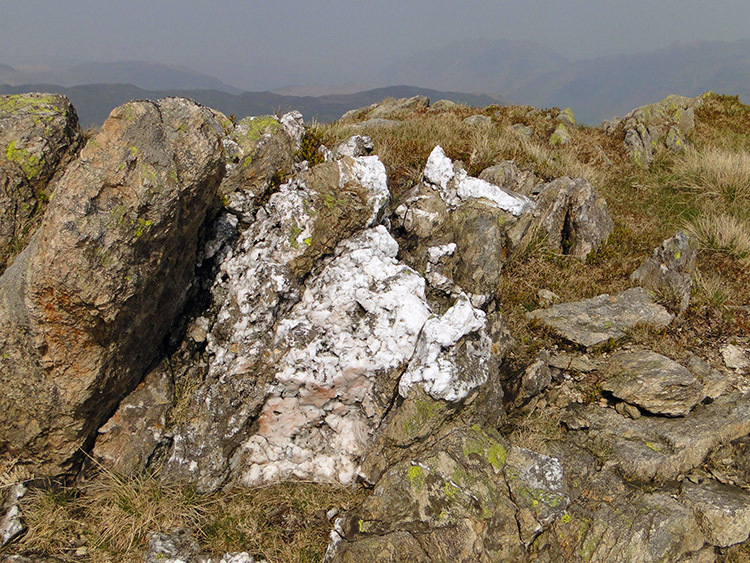 It was a relentless struggle and the breaks got longer and longer as I climbed up to the summit of Hart Crag at 822 metres, the highest point of the walk. Sufficiently knackered I got to the summit, sat with the lads, recovered my senses and took in liquid to rehydrate. On catching my breath I told the lads I could not do the extra two fells, High Pike and Low Pike. They told me they had already decided not to do them anyway. 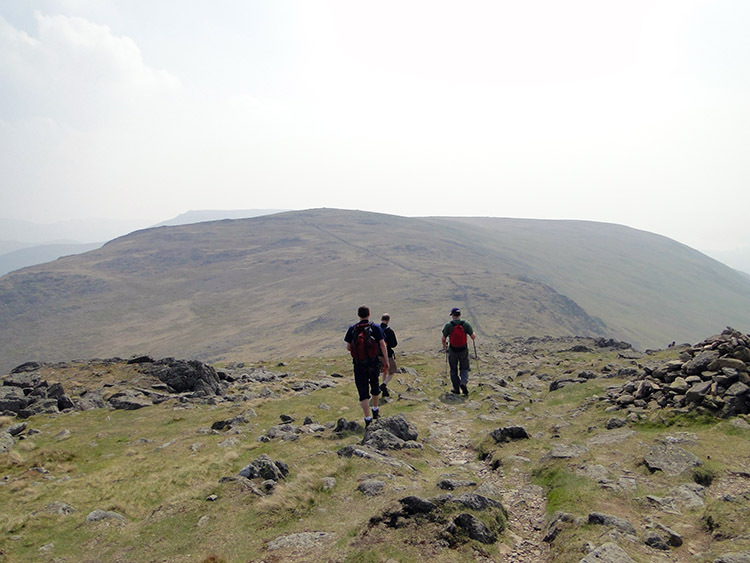 Despite being in better shape than me they too were adequately sated by the walk and with the stunning views of the north eastern fells on offer including Helvellyn which was clearly visible over the near mass of Fairfield to the north-west. 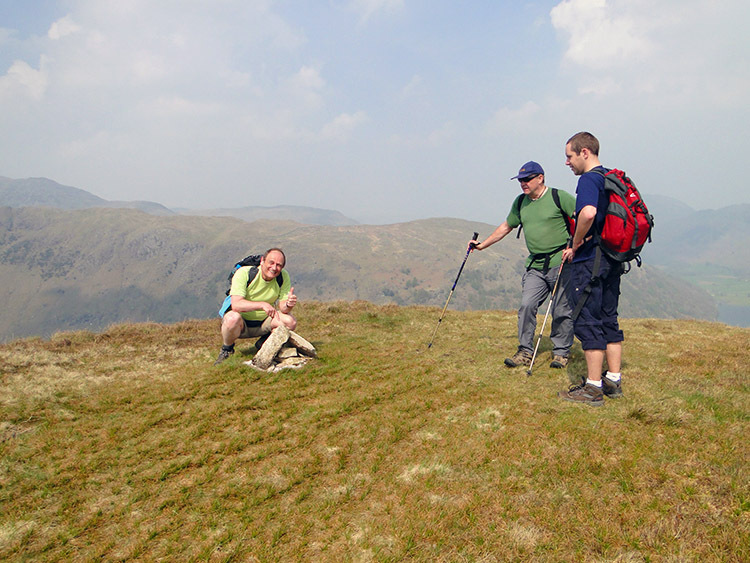 Agreed on our plan we cut the Wainwright count to five and the remaining three were all at lower elevation. 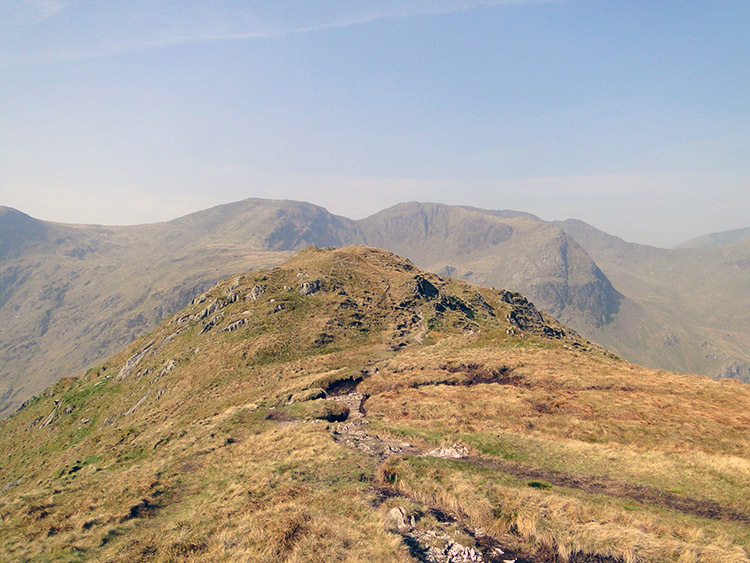 First in line was Dove Crag, exactly one easy kilometer away to the south-east. Unlike the break on Hartsop above How the break on Hart Crag had worked wonders. No doubt so had the liquid intake and at last the nausea was gone. Still not at my best I at least now kept the pace and thus the company of my pals. I was enjoying the walk again. We reached and passed Dove Crag without fuss and looked across the wide high expanse of Bakestones Moss to Little Hart Crag, the fourth Wainwright Fell of the walk distinctly providing a suitable target beyond. I was actually bounding along now and through the wall I emerged relieved it was all over. 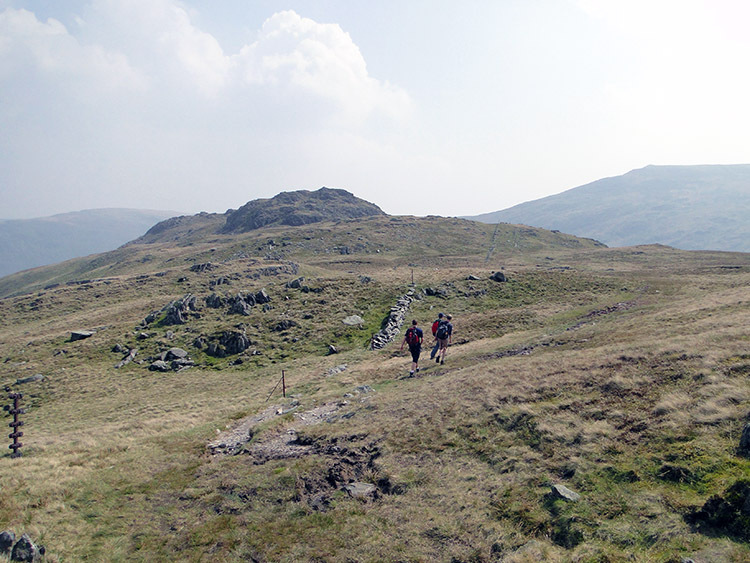 I really enjoyed the journey between Dove Crag and Little Hart Crag. It was a hot day, predominantly sunny and uncharacteristic of early Spring. The delightful weather raised the spirits to a height that had me sprinting up the rocky tor of Little Hart Crag. Dave joined me while Jez and Tom walked round to wait for us on the other side of the summit knoll. They missed a treat as the once on the top level we came across a delightful tarn set among the interesting rock formations. 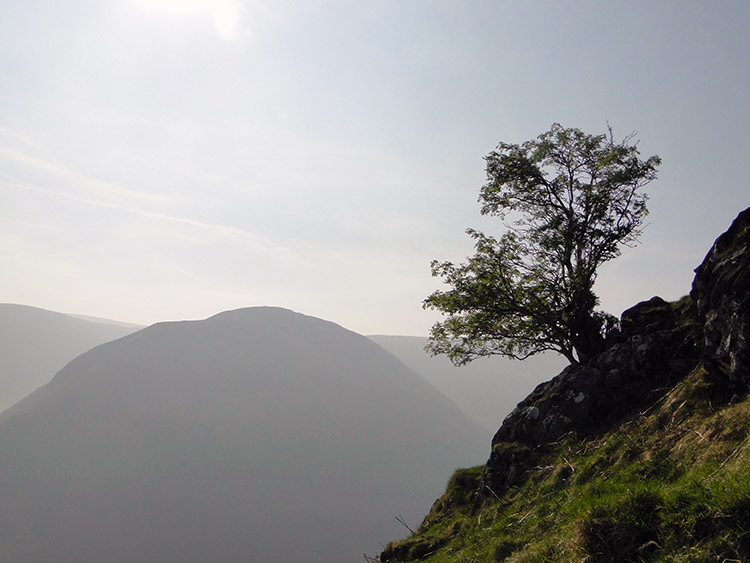 And Little Hart Crag is the best place to survey Scandale. 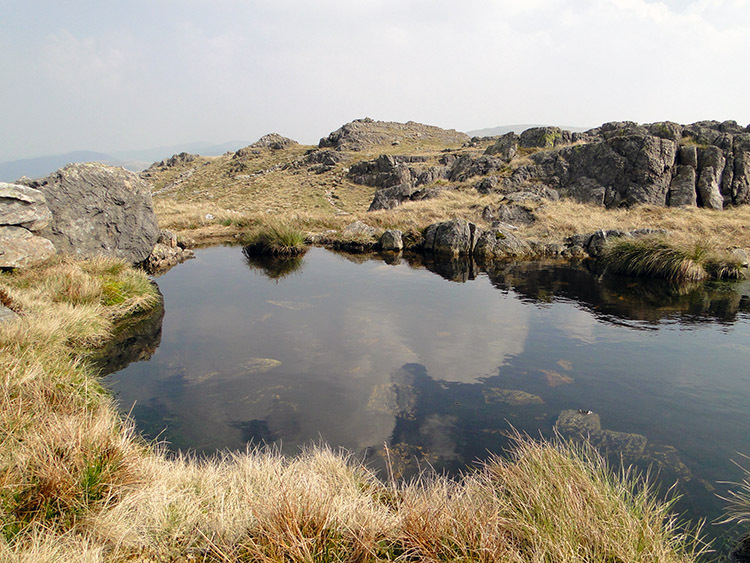 "This is the best viewpoint for Scandale" said Wainwright in his pictorial guide to the Eastern Fells. 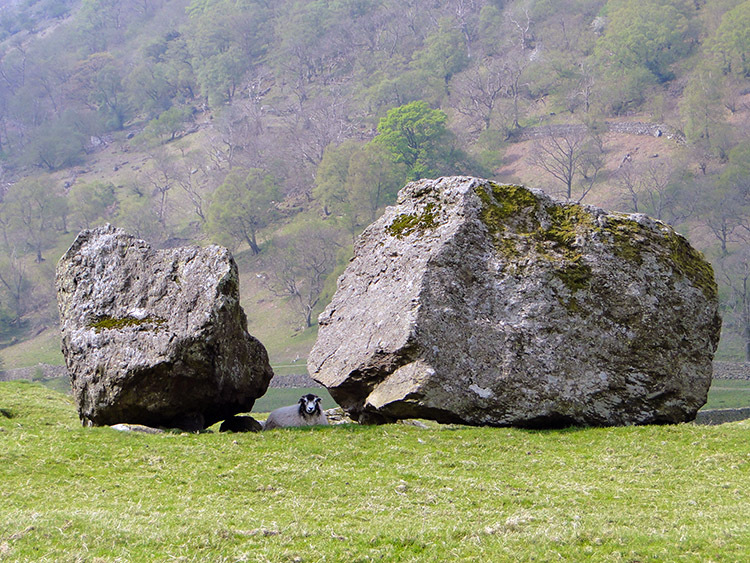 Dave and I found lots of marbled stone here too, a delightful contrast to the grey Lakeland stone. Dave and I enjoyed our exploration of the interesting terrain on Little Hart Crag and once done we descended from the rock platform to the grassy hill below where Jez and Tom waiting. From here we ambled on a slight descent for almost a mile to reach High Hartsop Dodd, the fifth and final Wainwright of the walk and probably the easiest access ever to any Wainwright Fell I will ever had for we virtually dropped on it. No effort at all, but there was a sting in the tail for although it was an easy access to the summit with the smallest cairn ever on its summit it certainly was not an easy egress. The descent was a steep knee jerking, calf pulling, thigh breaking challenge. For the immediate 800 metres following the summit we descended 300 metres in height, a 40% gradient that required serious attention and full concentration. The views straight ahead of us north to Brothers Water and the Patterdale Fells were brilliant though and I took steps to halt the tough descent sometimes and take them in. The huge cairn on High Hartsop Dodd! Practically all the muscles in my leg were burning due to the effort and braking once I levelled off near to the joining point of Dovedale Beck and Kirkstone Beck. So was everyone else's. Tom and Dave had even let the brakes off and run the final steep yards to the level ground. At the convergence of the becks I looked back to High Hartsop How and thrilled in the view of a wonderful pyramid of a mountain. It looks ever so imposing from the north and with its twin Hartsop Dodd to its left a similar pyramid shape they look like two giants made from the same mould. They do share a wonderful natural symmetry that must be seen to be believed. The work was done, the wall was hit and I had emerged the other side. 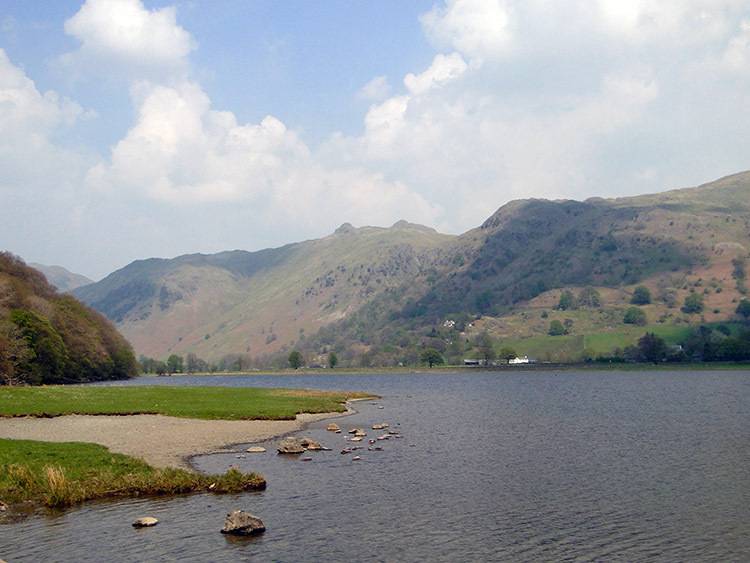 The high mountains, ridges and passes were behind us, the steep ascents and descents evident in the muscle work in our legs and yet there was the final delight of a walk past Brothers Water to enjoy. I lost the lads once again, they cut off to Sykeside camp shop for ice cream while I took photographs of geological erratics, sheep and lambs. 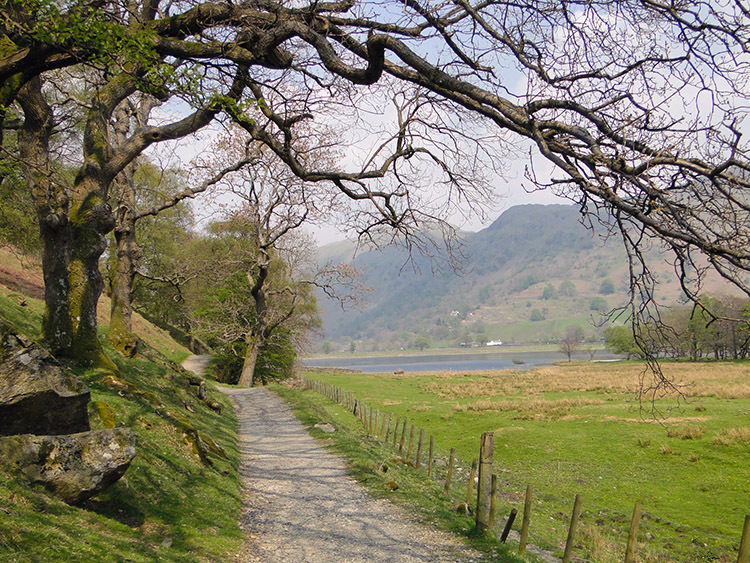 So I walked along the path beside the west edge of Brothers Water alone but did take time out to speak with a lady artist who was painting a watercolour of a scene I wanted on camera, the photograph being the final picture in this report. We agreed on the delightful weather we were having and on the pleasure of being in such a wonderful place on a wonderful day. 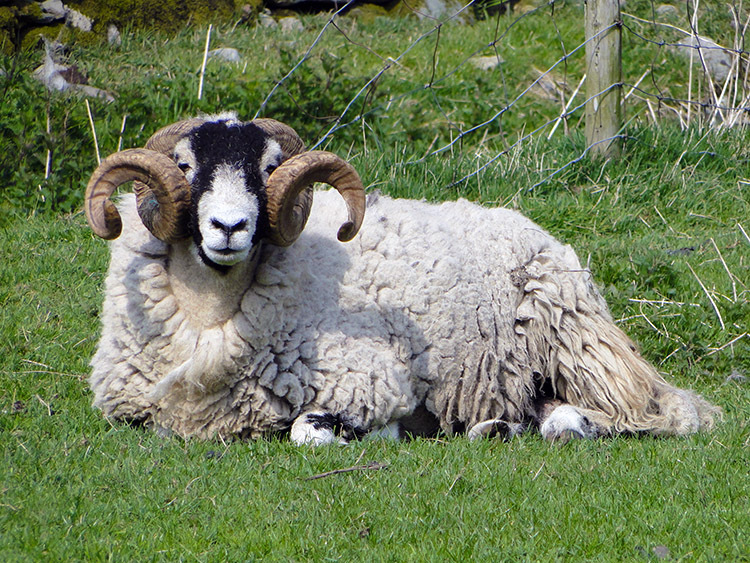 I was all well with my lot and smiled my way to the car park at the north end of Brothers Water. Where were Dave, Jez and Tom? I had not seen them deviate for the ice cream and on their return was glad I had not. The campsite shop had no power and thus no ice cream, a wasted journey for my three intrepid colleagues. I promised to stop at the first garage on the way home and let them get one. I did so and Jez treated me to an orange lollipop It was so refreshing.